This guide to all categories of mind-active drugs is headed for controversy--for it presents detailed information on the premise that many of these drugs can be used safely and responsibly. Well, a physician-pharmacologist and exponent of higher-consciousness (The Natural Mind, The Marriage of the Sun and Moon), and co-author Rosen do not make this argument lightly: they want us to recognize that teaching correct use is the best way to prevent abuse. So, for stimulants, depressants, hallucinogens, marijuana, solvents and inhalants, deliriants, PCP, medical drugs, and herbal remedies, they seek to present everything known about recreational use--and to dispel the prevailing scare myths (e.g., LSD has never been conclusively shown to cause chromosomal damage or psychosis). The information includes the source of the drug (plants, synthetic); its original or legal use, if any; and all its known effects (short-and long-term). 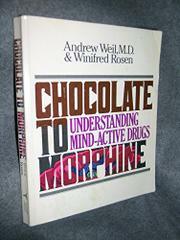 What will most provoke reader-reaction, however, are the detailed descriptions of how the drugs are prepared and used ("psychedelic mushrooms may taste better and are less likely to cause discomfort if they are dried or lightly cooked before being eaten")--along with the "Suggestions and Precautions for Use" of each of the drug categories. For those determined to use such substances, the guidelines are generally worthwhile, though some pointers ("know your sources" of street drugs) are unrealistic and useless. Well and Rosen remind us, with cause, that virtually everyone uses some mind-active drug (coffee is a potent, potentially harmful addiction for many), and that all efforts to combat so-called drug abuses have been unsuccessful. Their argument for a new approach--responsible recreational drug use with non-judgmental help for the needy--is well presented. The premise, however, is still extremely difficult to accept.